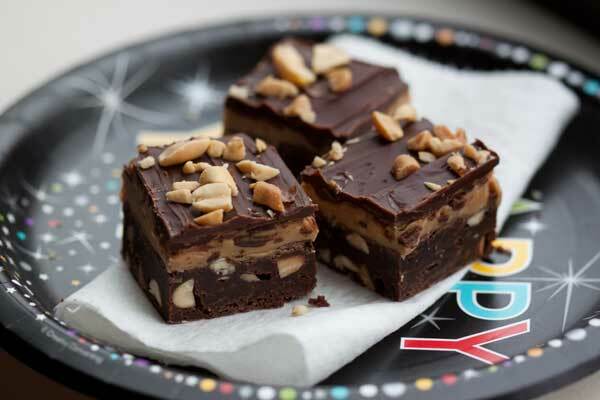 This awesome recipe for Peanut Butter Fudge Brownies is based on one from Dorie Greenspan. The original version is baked in a 9×13 inch pan, but I halved it and baked the brownies in an 8 inch square pan. I also upped the ratio of chocolate to butter in the ganache and omitted the nutmeg. As you can tell from the photos, I’ve been baking these for a long time! Here’s an old photo. These days I cut them into smaller squares as in the pictures above. Preheat oven to 325°F. Line an 8 inch baking pan with nonstick foil. Place butter and both chocolates in a 3 quart saucepan. Set over medium-low heat and stir until melted and smooth. Whisk in sugar, vanilla and salt, then add eggs, one at a time, stirring just until mixed. Add flour and stir until blended, then stir in nuts. Spread in prepared pan and bake until tester inserted into center comes out with moist crumbs attached, about 25 minutes. Place pan on rack and let cool. Frosting: Using an electric mixer, beat the peanut butter and the 2 tablespoons of butter in medium bowl to blend. Beat in powdered sugar and salt, then milk and vanilla. Spread frosting over brownies and chill for about an hour to set frosting (this makes spreading the chocolate ganache easier). Ganache: Place chocolate and the 2 tablespoons of butter in a small microwave-safe bowl or 2 cup Pyrex measuring cup. Heat on high 30 seconds. Stir and repeat until smooth. Drop ganache all over frosting; spread to cover. Chill until set, about 1 1/2 hours. Using foil as aid, transfer brownie cake to work surface; cut into squares. Bring to room temperature; serve. These brownies are amazing. Everyone I’ve made them for still talks about them (and wants more). Carol, my first one was in Hollywood. Kelli, it’s hard to go wrong with pb & choc. Debbi, you can make the Frito brownies and get back to me. Glad to know it’s nice and sunny somewhere in Texas. Mother Nature just piled on another 15 inches of snow this weekend here. Ugh. Makes me feel like baking. 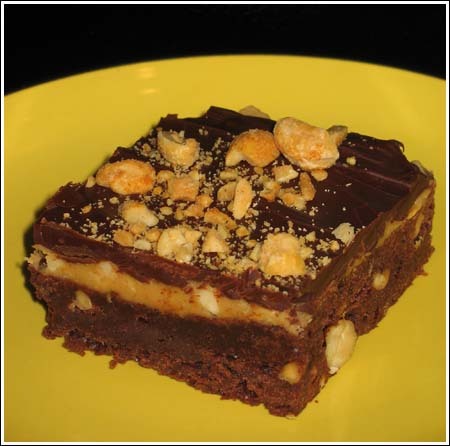 You know – the Frito Brownie could work……. 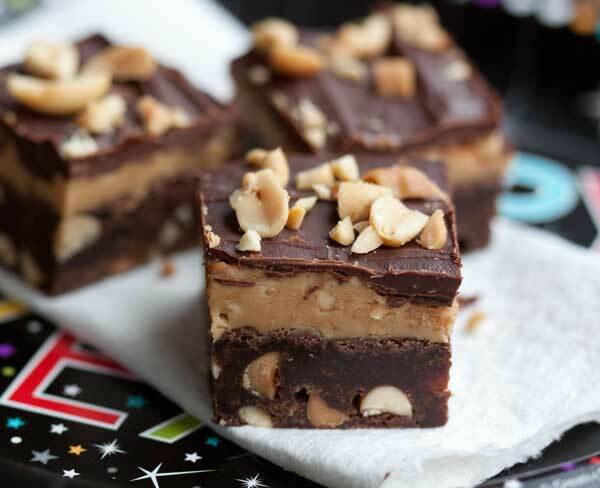 Two peanut butter and chocolate recipes in one week? Color me happy!! another winner, Anna. Too bad you can’rt do Pillsbury again. BTW, was that your first time at the BO?